RENDITION is one of Chicago’s most entertaining cover bands. RENDITION plays hundreds of shows each year, from clubs and colleges, to festivals and private events. Mixed with a HIGH ENERGY stage show and an extensive song list, RENDITION appeals to a wide range of audiences. 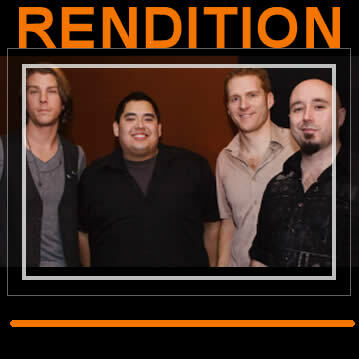 From Alternative to Dance, Country to Rock or Classic to Rap, RENDITION does it all. If you have not seen them yet, you are in for an amazing event!!! RENDITION is a “The Knot Best Of Weddings” top pick! We have discovered that nothing tops a wedding better than live dance music with RENDITION!!! We DJ, we announce, we play . . . you DANCE!!! Be sure to get your date locked in and let’s get the party started!!! RENDITION is constantly adding more and more clients to their every growing list of bars, private events, weddings and festivals! We love what we do. We have met some of the greatest people out there and have the most loyal fans in the world. We thank everyone for their support and look forward to seeing everyone out there on the road ahead! This is only the beginning!! !